Kids who love dinosaurs love to read books about dinosaurs too. Here are three recent publications I whole-heartedly recommend. Big Book of Aussie Dinosaurs was written by Kel Richards, illustrated by Glen Singleton and published by Scholastic Australia, 2014. RRP: $Au16.99. Stomp your way through the BIG world of Aussie dinosaurs! Discover the wonderful world of prehistoric Australia in this fun book which will entertain and inform all young readers. Includes loads of pictures and facts on every page — and even a pronunciation guide to help kids say all those tricky dino names! This picture book for children has been cleverly constructed. Richards knows how to speak to kids - his facts are carefully chosen for maximum interest and conciseness of explanation. Singleton’s quirky cartoons are really funny and help kids understand the facts. Both prove once and for all that non-fiction doesn’t need to be boring. I love that these are actual Australian dinosaurs, and kids will also love the gallery at the end, complete with both nicknames and scientific names. The Three Triceratops Tuff was written and illustrated by Stephen Shaskan, and published by Koala Books for Scholastic Australia, 2014. RRP: $Au14.99. A Cretaceous retelling of 'The Three Billy Goats Gruff'! Three Triceratops brothers by the name of Tuff are on a mission to find some grub. There’s just one thing standing in their way: a Tyrannosaurus Rex who has a very different idea of what’s for dinner! There have been many variations on The Three Billy Goats Gruff story. I appreciate such books because they help beginning readers predict the text, and feel comfortable with a story. However, I enjoyed The Three Triceratops Tuff for its own sake - I do love a book that makes me laugh. Shaskan’s humour is evident from the start: Once upon a time, sixty eight million years ago... The dialogue is as snappy as T Rex’s jaws, and the illustrations are wonderful! Gigantosaurus was written and illustrated by Johnny Duddle, and published by Koala Books, an imprint of Scholastic Australia (2014). RRP: $Au14.99. Kids are going to love Gigantosaurus. It makes a great read-aloud, because of the rhyming text. The illustrations invite long scrutiny of all the details. At the climax of the story, there’s a foldout page, revealing Gigantosaurus in all his hugeness. In fact this book is bursting with fun and child-appeal. There are also end notes to explain the real dinosaurs the characters are based on. 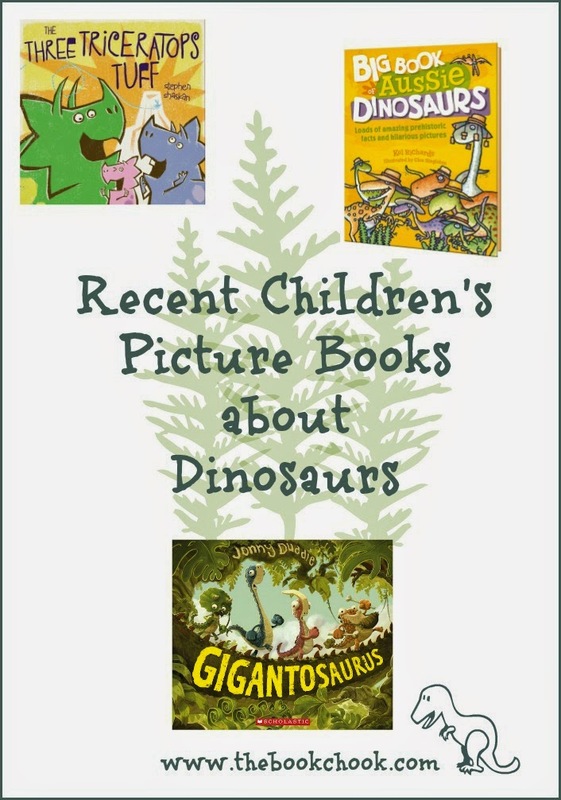 If your kids love to read and learn about dinosaurs, you might be interested in Dinosaur Books for Kids, Letter to the Book Chook - Dinosaur Books, Children’s Learning - Dinosaurs, Fun Picture Books for Pre-schoolers, Children’s Book Review - The Little Dinosaur, and I’m a Dirty Dinosaur - Review and Activities.